Add a shot of adrenaline to your group event! 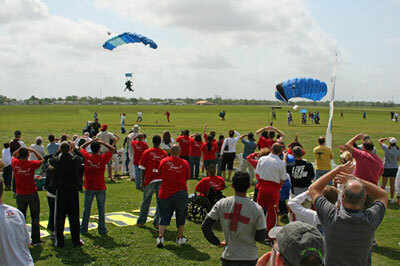 Skydive Spaceland can handle groups of almost any size. We can help you take the plunge… literally! Are you looking for a unique, adrenaline-blasting experience for a big group of friends, family, or co-workers? Or maybe you’ve got something smaller in mind, such as a special marriage proposal? Either way, we’re standing by to hook you up! Skydive Spaceland is a full-service, full-time, private skydiving facility that’s capable of handling up to 300 first-time skydivers in a day with all the amenities. And we do mean ALL the amenities, including top-of-the line skydiving equipment; full-time, highly experienced instructors; air-conditioned classrooms, office, and deli; and a covered front porch and second-story observation deck for the best view of all the fun! On the other hand, we like the small special events too–it’s hard to beat being a part of a special marriage proposal or wedding, especially when it’s tied to skydiving! 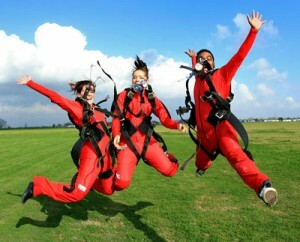 Whatever kind of event you have in mind, we can take it to the next level by adding the adrenaline of freefall! Our private facility is capable of hosting small to large events including stage, sound system, tables/chairs, classrooms, food/drink, ring bearer, reverend–whatever you need! Please call us at 512-488-2214 to discuss how we can add a ton of awesome to your event!